Last major update issued on June 5, 2006 at 04:00 UTC. The geomagnetic field was inactive to very quiet on June 4. Solar wind speed ranged between 355 and 461 km/s (all day average 396 km/s - down 118 km/s from the previous day). Solar flux measured at 20h UTC on 2.8 GHz was 75.6. The planetary A index was 2 (STAR Ap - based on the mean of three hour interval ap indices: 2.4). Three hour interval K indices: 10001111 (planetary), 01101011 (Boulder). 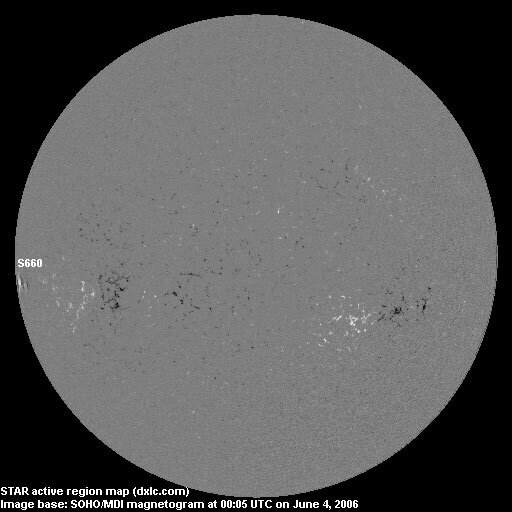 New region 10892 rotated into view at the southeast limb on June 3 and was numbered the next day by NOAA/SEC. C flares are possible. June 2-4: No partly or fully Earth directed CMEs were observed in incomplete LASCO imagery. 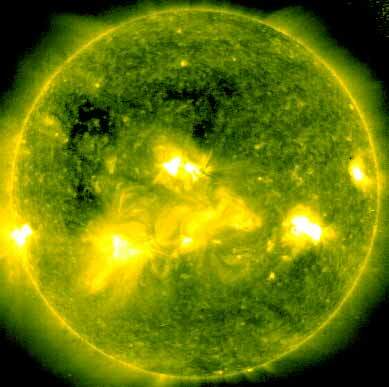 A recurrent coronal hole (CH227) in the northern hemisphere will rotate into an Earth facing position on June 4-6. 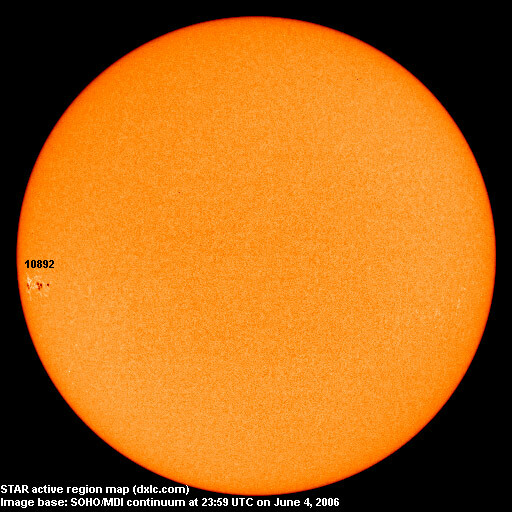 The geomagnetic field is expected to be mostly quiet June 5-6 and quiet to minor storm on June 7-9 due to a high speed stream from CH227. Long distance low and medium frequency (below 2 MHz) propagation along east-west paths over high and upper middle latitudes is poor. Propagation on long distance northeast-southwest paths is good. Trans Atlantic propagation conditions are normally monitored every night on 1470 kHz. Radio Cristal del Uruguay was the dominant signal tonight. Propagation was similar to the previous day with many stations from Argentina, Uruguay and Brazil audible. 1540 Radio Mon (Argentina) was again impressive and 850 Radio Carve (Uruguay) had a good signal. June has so far been a much better month than May was for long distance trans equatorial propagation.